Before the new direct wine shipper license will go into effect Beacon Hill has already started to tinker with the statutory limits of the license. This week Rep. John Sciback a Democrat from South Hadley and the House Chair of the Joint Committee on Consumer Protection and Professional Licensure introduced a bill that would amend the s. 19F license to allow for direct shipments to re-sellers, and not just consumers. This change may create an end-run around wholesalers for manufacturers looking to move product into the hands of retailers. See the full text below. (b) Under this section, a direct wine shipper licensee may make sales and delivery of wine: (1) at retail directly to residents of the commonwealth who are 21 years of age or older, for personal use and not for resale; (2) at wholesale in kegs, casks, barrels or bottles to a person licensed pursuant to section 12, 13 or 14; provided, however, that all direct deliveries of wine from a winery to a licensee pursuant to section 12, 13, or 14 shall not exceed 250 cases of wine annually; (3) at wholesale for the sole purpose of resale in containers in which wine was delivered to any person licensed pursuant to section 15; provided, however, that all direct deliveries of wine from a winery to a section 15 licensee shall not exceed 250 cases of wine annually; (4) at wholesale to a person licensed pursuant to section 18, 19 or 19B; (5) at wholesale to churches and religious societies, educational institutions, incorporated hospitals, homes for the aged, manufacturers of food products and manufacturers of drugs and chemicals pursuant to section 28; or (6) at wholesale to a registered pharmacist holding a certificate of fitness pursuant to section 30. Starting January 1, 2015 wineries, vineyards, and other wine manufacturers can begin the process of becoming licensed to directly ship wine to Massachusetts consumers. This change in M.G.L. c. 138 was included in the FY 2015 Budget signed into law by Governor Deval Patrick. According to the Boston Globe at least 91 wineries have already applied for the new license. Because both manufacturers and the trucks used for transporting wine are regulated by the state FedEx has also applied for an additional 700 licenses to transport. 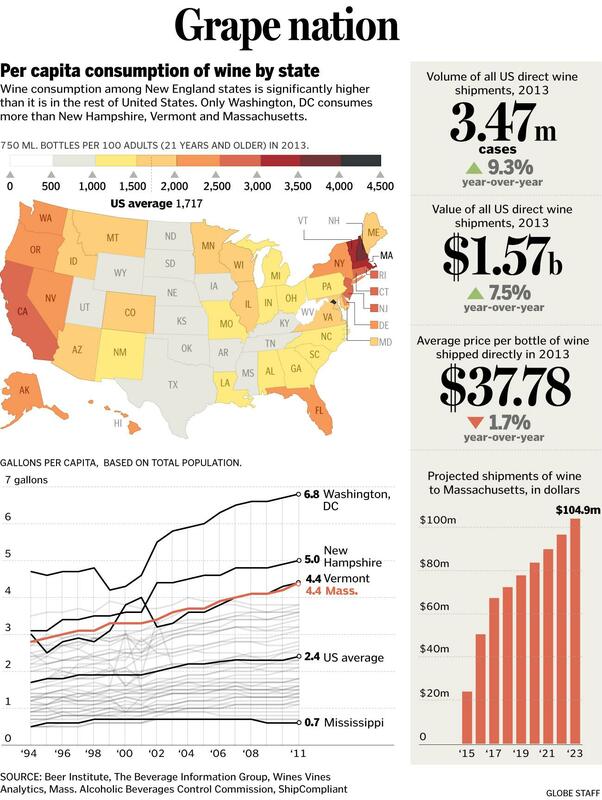 Massachusetts is one of the leading states in the nation in per capita wine consumption and the new direct wine shipper license will open a new avenue for out of state wine manufacturers. The new license will allow manufacturers to deliver directly to consumers, but not allow sales to Massachusetts retailers. The ABCC issued an advisory on direct wine shipping that will help guide the wine industry in interpreting the new changes. This advisory includes who qualifies for the new license and how to comply with reporting obligations as well as licensing fees.